Lewis Hamilton responded over that last lap. It will be interesting to see what he has to say about it. Wasn't that thrilling! The straight-line speed advantage of the Mercedes was always going to help Lewis Hamilton at the end. That was a bizarre end to the grand prix. 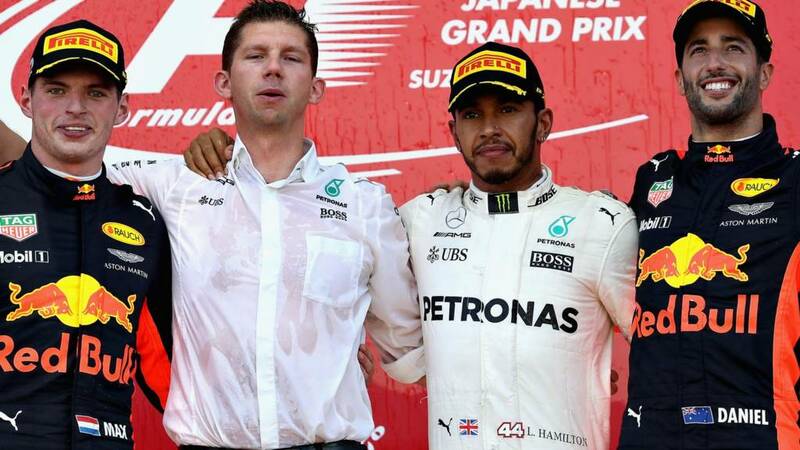 LEWIS HAMILTON WINS THE JAPANESE GRAND PRIX. With leaders off into the distance, Fernando Alonso attacks Felipe Massa. This is for a points finish. Lewis Hamilton approaches Fernando Alonso and the McLaren moves aside to let him through but Max Vestappen then gets momentarily caught behind the Spaniard. Lewis Hamilton's pace into the corners has dropped away. Just THREE TENTHS between Lewis Hamilton and Max Verstappen now. "Am I allowed to give it everything?" asks Verstappen. Lewis Hamitlon definitely has a problem. We could be in for a grandstand finish here. A McLaren points finish is on! Fernando Alonso is 11th with just Felipe Massa's struggling Williams ahead of him. I am sure Lewis Hamilton will say he is not yet thinking of the championship but the pressure that has fallen away from him after the failure of Sebastian Vettel's car is amazing. Lance Stroll's Williams is lifted off the track and the virtual safety car comes to an end with four laps to go. There was a collapse of some kind on the front right for Lance Stroll. A worrying moment for him. It has been a disappointing race for the Williams team, even with Felipe Massa in 10th place and point scoring. Massa started eighth and looked set for a decent finish. Looks like Lance Stroll picked up a puncture through the esses. He is out of the car and that's his race over. Lance Stroll slides off the track, cutting a corner and almost ends up in the path of Daniel Ricciardo. A slightly scary moment for Ricciardo then. "Something wrong with the car, " says Stroll. Virtual Safety Car is deployed.